The first cost indication for the gigantic Huawei Ascend Mate has popped up online, suggesting a highly affordable price tag. Chinese site Liaow has published a pre-order page for the 6.1-inch Ascend Mate with a speculative price of $575 (around £366/AU£550). That would make the Ascend Mate significantly cheaper than its closest rival, the 5.5-inch Samsung Galaxy Note 2, which currently sells for around $700/£470/AU$999. However, let's not get ahead of ourselves, as the Chinese price will probably carry some hefty tax and other price hikes when it makes it way across the waters, so the Huawei Ascend Mate could cost significantly more when it appears. 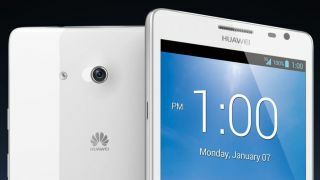 Huawei launched the Ascend Mate at CES 2013 in Las Vegas and as well as the massive 6.1-inch IPS+ HD display the huge handset also packs a 1.5GHz quad-core processor, 32GB of internal storage, 8MP camera, 4,050mAh battery and Android Jelly Bean. This means you'll get a lot of bang for your buck and anyone who's been tempted by the Galaxy Note 2 but put off by its lofty price tag may be licking their lips at Huawei's proposition. During our hands on Huawei Ascend Mate review we noted that the smartphone did feel a little slow under thumb, not to mention the sheer size of the thing which makes it tricky to grasp.